As soon as you begin mentally mapping the featureless layout of the Losail International Circuit, it gets dark, the floodlights come on and the track layout changes in a surreal manner. A desert haze drifts through the infield, and in addition to remembering if the approaching corner is the slow left one or the fast left one, you’re also now looking through faceshield glares and the occasional glimpse of you passing your own shadow. Steadfast among all these nocturnal distractions is the familiarity of the Super Duke R’s performance, its booming exhaust note, and that deliciously torquey V-Twin. The Beast 2.0 is the next-gen super-nasty naked from KTM – an upgraded version of what is arguably the most dominant naked streetfighter this side of an Aprilia Tuono. Messing around too much with a model already in possession of the class mantle is a way to either ensure continued dominance or to self-sabotage by delivering unpopular changes. Thankfully, KTM seems to have chosen the better route of polishing the rough edges of its flagship model, while also gifting the SDR with a variety of useful electronic upgrades, thus avoiding any fall from grace such as what happened with Suzuki’s SV650 to Gladius misfire. The 2017 Super Duke R is obvious by way of its new headlight, tank shrouds, and (lack of) rear bodywork. The headlight is fashionable as well as functional, the split design allowing for airflow through the center to help cool the LED lights, reflectors and light control units. Changes to the 2017 model were reported in our November preview of the Super Duke R, so having now ridden the bike, let’s focus on the performance and usefulness of these upgrades. And to begin we go right to what we love most about the SDR, its 75° V-Twin LC8 engine. A compression ratio bump of 0.4 (13.6:1 vs 13.2:1), new pistons and exhaust system reportedly gives the SDR a claimed increase of four more horsepower, while KTM says torque remains the same at 104 lb-ft of torque. Having no 2016 model with which to make a direct comparison, it’s awful hard to say if this minor increase can be felt, and that’s largely because of how powerful and user-friendly last year’s engine was already known to be. What we know for certain is beneficial is the extra 500 rpm the Twin has to spin up to. This gain in over-rev allowed a few sections of Losail to be taken in a single gear, whereas the 2016 SDR most likely would have required an brief upshift before arriving at the corner. 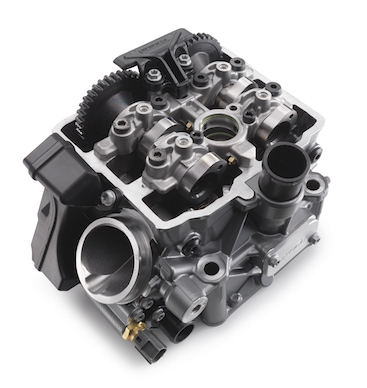 The 500-rpm-higher rev ceiling was realised by virtue of new titanium intake valves, working in conjunction with shorter intake tracks and a new intake resonator. An added benefit is an engine that’s willing to spin-up faster while smoothly delivering gobs of torquey, forward thrust. KTM also claims better fuel efficiency for the 2017 engine. Sticking with performance we move on to what are the performance highlights of the 2017 model: Electronics. Cornering-ABS (C-ABS) was actually introduced on the 2016 model, but deserves mention again. EiC Kevin Duke and I tested this technology earlier this year on a specially equipped 1190 Adventure and came away convinced of its safety advantages on the street. Also integrated into last year’s model were traction control and ABS, but these were tied to the selectable ride modes with preset parameters and no way to adjust for personal preferences other than switching them off. For 2017, the base model SDR comes with selectable ABS with two modes, Road and Supermoto, as well as Off. The Road setting keeps ABS and C-ABS functional at both wheels, and it works best at street speeds and braking forces. 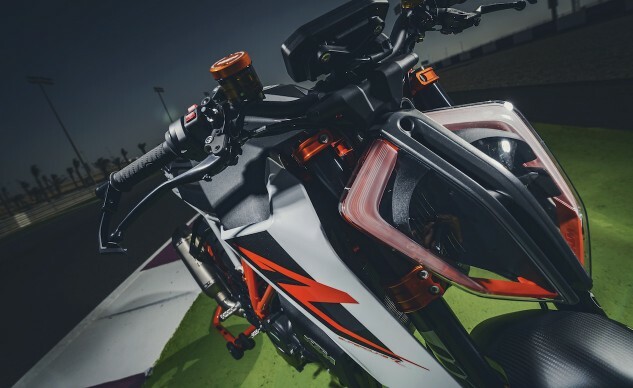 For the track you’ll want to switch to the Supermoto setting as it turns off ABS at the rear wheel, C-ABS altogether, and allows for much more aggressive front-end braking. The difference between the two settings is night and day. Forgetting to check which brake setting the bike was in before leaving for session two, I promptly returned to the pits thinking something was wrong with the front brake, only to learn it was in Road mode and not Supermoto. Switching to Supermoto solved the problem, which was the only issue I experienced with the SDR during the entire track session. After an initial outing in Sport mode, I switched to Track mode with Track throttle sensitivity, Supermoto brake selection, and kept anti-wheelie engaged most of the time. In Track mode, TC is adjustable on the fly via the familiar left-handlebar-mounted controls. Track throttle sensitivity seemed smooth as butter, without the abruptness oftentimes associated with aggressive R-b-W throttle settings. Further personalization is realized with the purchase of the optional Track Package, which includes Track ride mode (in addition to Street, Sport, Rain), the option to disengage the anti-wheelie function, Launch Control, adjustable traction control, and a choice of Street, Sport or Track throttle sensitivity. Switching off the anti-wheelie function enables the hooligan in most riders, but even with anti-wheelie working the SDR will loft the front wheel into a shallow wheelie when powering out of corners (see main image). The SDR’s Bosch traction-control system worked fine on the previous model Super Duke R, but the added benefit of adjusting the system to account for changing track or tire conditions is a function we’ve been fond for years. The SDR system works quietly in the background, keeping things from getting out of hand (which is easy to do when cranked into a corner on a bike with this much torque) with the only indication it’s working being the flashing light on the instrument cluster. Engage Launch Control. Hold the throttle wide open, release clutch carefully, keep the throttle pinned or the system disengages. It takes a while to force yourself not to roll out of the throttle when the front end starts lifting. 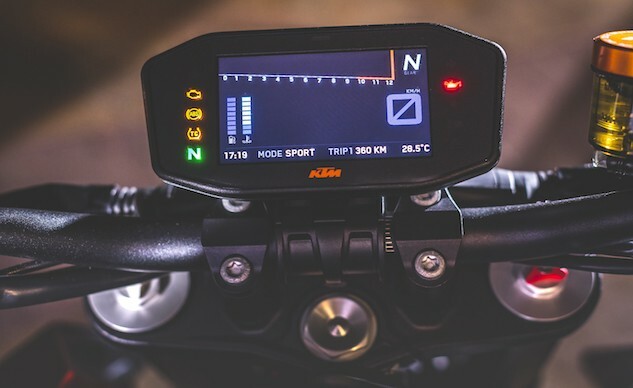 The other optional package is the Performance Pack that includes the quick-shifter+, the motor-slip regulation (MSR), and smartphone integration known as KTM My Ride. First and foremost is the quick-shifter+ that makes rapid-fire upshifts easy, and auto-blipping downshifts just as easy. It’s a technology that once you’ve ridden with it in a track setting, it’s hard going back to not having it. The Losail experience proved the track-worthiness of the SDR’s quick-shifter+, but how the system functions in a street-legal environment is yet to be seen. If, like other quick-shifters, the system proves to be fussy at anything less than full throttle, the system can be shut off for better use of the clutch via the traditional lever. According to KTM, some of the functions (Quickshifter+, MSR, My Ride) can be purchased individually. Prices for the packages or individual items, however, were not available at press time. The new full color TFT display is informative, functional and attractive. The information displayed changes when switching to the optional Track mode. During our short street ride I had no problem with legibility even though I was wearing both sunglasses and a tinted faceshield. Note the adjustable handlebar settings. 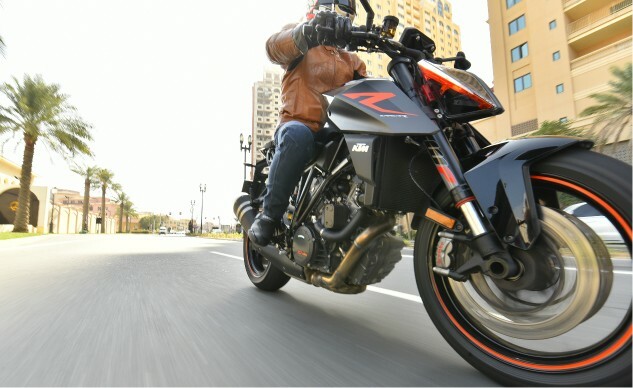 A new electronic feature that comes standard on the base model Super Duke R for 2017 is cruise control. Located on the left handlebar just above the traditional switchgear, the system requires at least third gear be selected to be operational and will maintain speeds between 38 and 120 mph. The system went untested during this press launch, but we’ve sampled other KTMs with cruise control, and we expect the SDR’s to function as well as those. What remains to be seen is how easily reachable the buttons are or if there’s some other idiosyncrasy giving us reason to complain. New handlebars are 20mm wider, 5mm lower and have been placed 18.5mm further forward. The more aggressive positioning was welcomed during our track ride but remains to be seen if the new positioning makes longer street ride less comfortable than its predecessor. Note the lack of an ignition switch. The new Dukester goes keyless with a remote fob. Chassis dimensions, curb weight and the estimable Brembo monoblock M50 calipers remain the same as before, but KTM did see fit to change the WP shock and fork. The shock comes with a stiffer preload setting (which is adjustable), while fork spring rates were increased slightly. The new fork also boasts the separation of compression and rebound damping into the left and right fork legs, respectively (this was already an attribute of last year’s fork). On the track the new Super Duke R felt very much like the old Super Duke R. By itself, it’s an incredibly formidable motorcycle, but without any geometry changes to this new version, we expect the SDR to feel slightly less nimble when ridden in the company of some of its more agile competitors. Again, this is no revelation, as in previous shootouts it’s been well documented that the SDR owns the longest wheelbase and most relaxed rake/trail numbers. But for the common street rider occasionally taking his Super Duker to a trackday, does it matter? Not at all. My recommendation is to install KTM’s available rearsets, because you may run out of ground clearance on the track with the stock units. And don’t worry too much about decreased legroom as the SDR has room to spare. The new Super Duke R rolls on Metzeler M7 RR rubber. 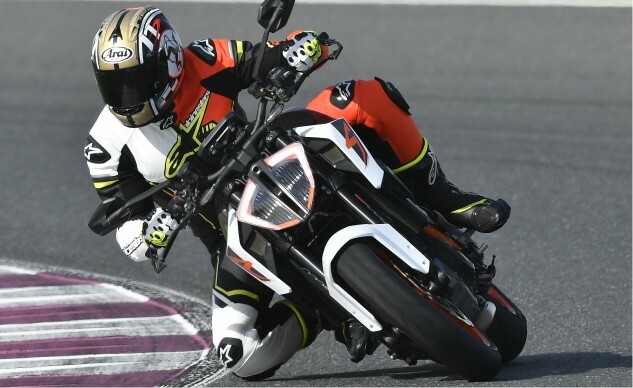 During our Losail trackday, the tires proved up to the task handling the Duke’s immense amount of torque, while providing excellent grip. A one-day track outing usually isn’t enough to proclaim anything definitive about any motorcycle. Except maybe this one. New features such as cruise control, upgraded suspension and a few more horsepower will certainly help the base model SDR stay competitive in future shootouts. 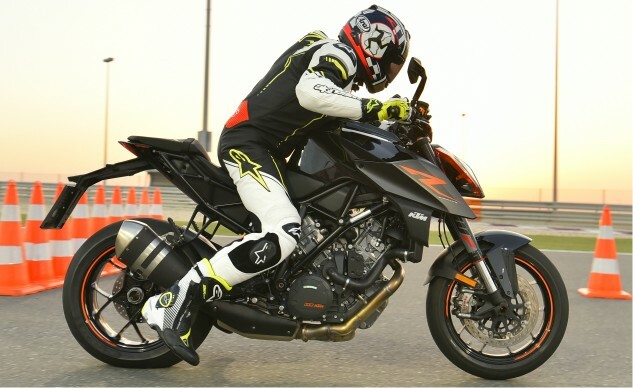 Outfitted with the optional Performance and Track packages, there’s little doubt of any other naked streetfighter giving the Super Duke R much competition except for it Italian nemesis, the Aprilia Tuono (which also enjoys some upgrades for 2017). At $17,999 the 2017 SDR’s MSRP increases $600 over the 2016 model ($17,399). Add the two optional packages (the combined price we’ve been told will come in under $1k), and you have the most awesomest streetfighter currently available for less than $19k. The only suggestion we have for KTM to improve upon the Super Duke’s current iteration is by including the two optional packages as standard equipment and outfitting the SDR with semi-active electronic suspension for the $18k MSRP.